Last week, my iPhone screen stopped working. It all began four months ago. I noticed the screen was coming off. At first, I was trying to push it back in. Then after a week, it wouldn't go back in. The screen started bending at the middle outwards. Then one fateful day, it came out from the middle upward, only the bottom part was still fastened to the iPhone. It became really embarrassing to use.There was a big visible gap between the phone body and the screen. Then it got worse. The screen would flicker occasionally. Like once or twice in a day, it would just go off and I would have to massage it to bring it back on. Gradually, it became more frequent. Like everytime I put in my pocket. So I decided to google for a possible solution. Alas, it is a common problem with iPhone 5 and the main reason Apple discontinued its production in just a year after launch and pushed people to get the iPhone 5s or 5c. The problem was the battery was expanding. It was sort of blowing up in size and pushing the screen out. The only solution is to replace the battery. So in March, I came across a tech genius in one of the shops in the E-centre, Yaba (where Ozone Cinema is). I gave him the phone and he replaced the battery. The problem was partly solved. The screen fits back in, so the bulge was gone. But the screen had been permanently damaged by my repeated pushing back in and hard massage. I managed it that way for one more month and finally decided it's either I get a new phone or fix it permanently as the flickering was back. 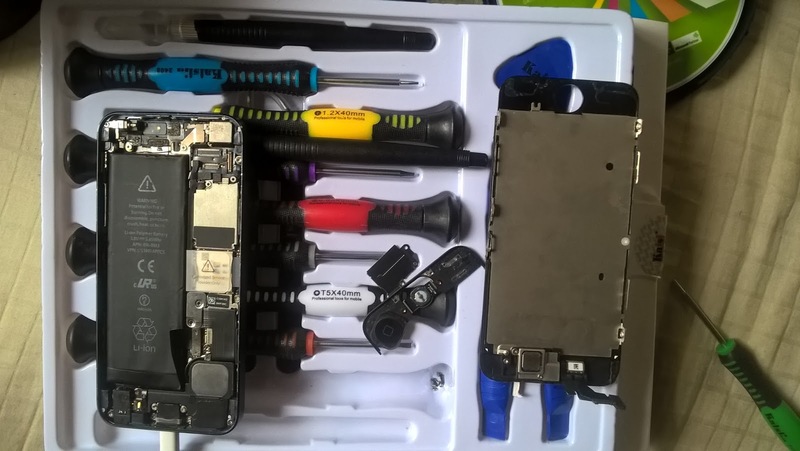 Thanks to Buhari, I opted for fixing the phone. I ordered a screen replacement part and even an extra battery on Amazon. Yesterday, it arrived. One week too late as the screen finally died last week Tuesday and nothing I did could revive it. So my MTN line was unreachable and people had to email me that I was unreachable (I gave them the Airtel line). Now I am very happy to say the phone is back on alive and looking new. I replaced the screen myself. Was a little tricky but I got it. My 5 years of Electrical Electronics Engineering degree, gladly, wasn't a waste. And for everyone who's been unable to Whatsapp me or reach me on my MTN line for 9 days now, there's also good news for you. You can now reach me.